RONNY DEILA last night accepted full responsibility for Celtic’s failure to reach the group stage of the Champions League for the second consecutive year under his command. The Norwegian had issued a personal pre-match guarantee of victory for his team in Malmo last night but watched them slump to a 2-0 defeat in the second leg of their play-off round tie at the Swedbank Stadium. 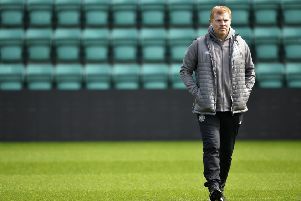 It completed a 4-3 aggregate loss for the Scottish champions, further blotting Deila’s copybook at Champions League level where he also oversaw qualifying round defeats against Legia Warsaw and Maribor last season. Deila accused his team of suffering stage fright on the big occasion but insisted the blame lies solely at his door as Celtic prepare for another group stage campaign in the second tier Europa League instead. “It was not like one player here or one player there, it was a team performance which was not at the level we can expect in these games. “We lose and win together. This is my responsibility. This team was not up to the level we can be and I am part of that. I am the leader of this team. There is some very hard learning to do. “We knew if we were at our best, we had a very good chance to go through. But we were not even close to that kind of performance. Malmo deserved to go through. We failed as a team, I failed. We didn’t deal with the pressure of these games. There is a lot of talking about the Champions League at Celtic and in Scotland. It makes it even bigger. It seems we didn’t cope with that pressure. “We can talk about a hundred situations today but the overall team performance is not good enough. We didn’t play defensively or offensively as a team. You couldn’t recognise any of the things we worked on before. Today we were not good enough. That’s my responsibility. “Yes, we are a much better team than we were last season but today we were not. But overall we are much better. Deila was unhappy at the decision to disallow a Nir Bitton goal for Celtic, when the score was 1-0, after a clear handball in the penalty area by Malmo defender Kari Arnason was not spotted. But he did not use it as an excuse. “I saw it afterwards, not so clearly at the time,” he said. “It was a big mistake, it could have changed the game. “It is irritating but in the end we didn’t reach it. I have to look at the overall performance and that wasn’t good enough today. “The performance is the most important reason we didn’t go through. There are a lot of very disappointed players in there, a lot of disappointed coaches as well. If we had played at our best, we had a good chance to go through. We have to accept Malmo deserved it and we are in the Europa League.